I have the following network which splits a site into a Corp/DMz style network as best I can with the limitations of the ASA in packer tracer. Both routers have static routes to the 10.100.0.0 and 172.16.0.0 networks pointing at the corresponding ASA interfaces and a classless route out the network. Both ASAs have two static routes. One for the inside network it covers and a classless route to its respective router (ASA1 to R1 and ASA2 to R2). From a machine inside the 10.100.0.0 network I can ping the inside R1 interface at 10.50.6.241. From R1 I can ping the router interface at 200.195.100.2. However, when I try and ping 200.195.100.2 from a machine inside the 10.100.0.0 network (or ASA1) the packet hits ASA1 and is bounced between the inside 10.50.6.249/30 interface on ASA1 and the outside 10.50.6.244/29 interface on ASA2 inside of ASA1 sending it to R1 as defined by its default route. Could anyone suggest why this might occur? 5   *         *         *         Request timed out. 6   *         *         *         Request timed out. 7   *         *         *         Request timed out. 8   *         *         *         Request timed out. 9   *         *         *         Request timed out. If I ping 200.195.100.6 from 10.100.0.0 it will get a reply as ASA1 will send the packet out of R2 (again, not it's default route). Dropbox link for the file. As an update since this discussion I have changed the interfaces on the switch from trunks to sit on routing vlan 6. 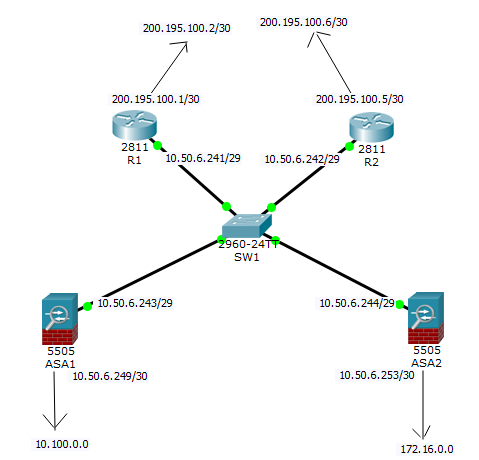 Browse other questions tagged routing cisco-asa packet-tracer or ask your own question.